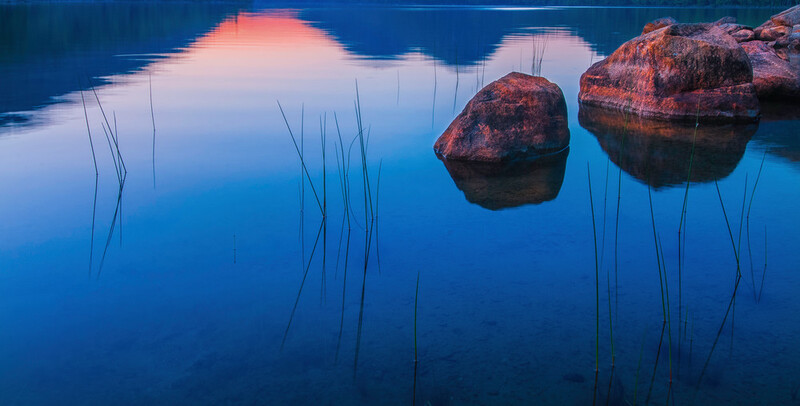 Cool blue tones are juxtaposed by the warm pinkish tones of Acadian granite in this tranquil semi-abstract nature print from Maine's Jordan Pond. The dark silhouette of the Bubbles mountains (North and South Bubbles) are reflected near the top of the image. Acadia's Jordan Pond has been so kind to me over the years. It's allowed me to explore it's secrets and reveal it's hidden beauty that is often hidden to most casual observers. This fine art nature print is best described as semi-abstract in nature. If you are looking for an art print with soothing tranquil tones, this is one to consider. This print is a wide format 2:1 aspect ratio. Sizes start at 20x10" and go up to 40x20"